If uncircumscribability is characteristic of God’s essence, and circumscription is characteristic of man’s essence, but Christ is from both: then He is made known in two properties, as in two natures. How would it not be blasphemous to say that He is uncircumscribed in body as well as spirit, since if His circumscription were removed His human nature would be removed also? If things do not have the same properties, then their essences are different. It is proper to divinity to be uncircumscribable, bodiless, and formless. It is proper to humanity to be circumscribed, tangible, and three-dimensional. If, therefore, Christ is from both essences, He must be both uncircumscribable and circumscribed. If He is only one or the other, He is of only the one essence of which He has the property — which is heretical. If Christ cannot be circumscribed, neither can He suffer; for impassibility is equivalent to uncircumscribability. But He is able to suffer, as the Scriptures say. Therefore, He is also circumscribable. If Christ is uncircumscribable, as you say, not only in respect to His divinity, but also in respect to His humanity, then His humanity is also divinity. For things which have the same properties also have one nature. But if He is of two natures, He is therefore also of two properties: otherwise, by the removal of circumscription, the nature of humanity would also be removed. If Christ is uncircumscribable, how can He Himself say, “They have pierced My hands and My feet; they have numbered all My bones” (LXX Ps. 21:16-17)? For that which is uncircumscribable does not have a nature to be pierced, nor to have its bones numbered. To believe these words is to confess the circumscription. 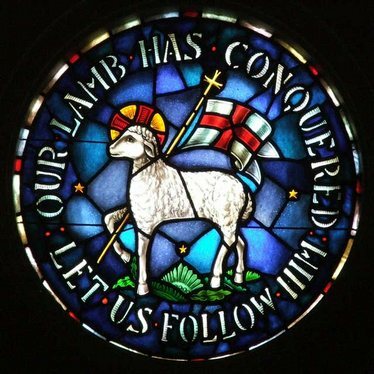 If Christ is uncircumscribable, how can the Forerunner say, “See the Lamb of God who takes away the sin of the world?” (Jn. 1:29) For that which is seen is not uncircumscribable, not to mention that which is pointed out with the finger. But if something should be seen and pointed out, then it would be within circumscription. Therefore, Christ is circumscribable. If Christ is not circumscribable, He is not of two natures, divinity and humanity, since He does not have the property of each. For circumscribability is characteristic of humanity. But if He is of two natures, how can He avoid having the properties of those whose natures He has? If Christ is not circumscribed, as you say, because He would be diminished in glory, then He was not conceived in the Virgin’s womb either, because He would have endured humiliation. But if He was not only conceived without humiliation, but even born as an infant, then He is circumscribed without shame. This paper is an examination of the content and iconography of the Kanon eis Psychorragounta (Canon for He Who Is at the Point of Death). This was the most important component of an akolouthia by the same name, a liturgical service meant to be read and sung on one’s behalf shortly before death. The canon’s extensive use and impact are evident in that it was depicted at least three times, once in manuscript illumination and twice in monumental painting, unusual given the rarity of illustrations of minor services. 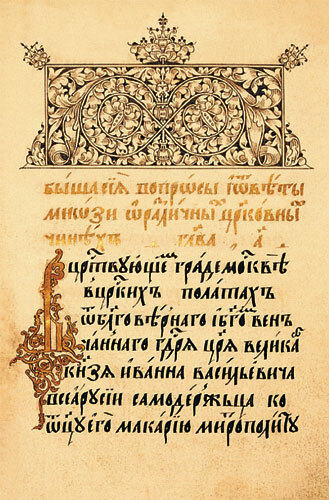 Because of its inclusion in euchologia, the prayer books used by clergy containing all the services of the Byzantine Rite, the author argues that the akolouthia and its canon provided a canonical, Church-sanctioned understanding of death and its immediate aftermath and exerted a normative inﬂuence on people’s perception of the separation of the soul from the body and subsequent events. On the most basic level, the iconography of the canon is meant to illustrate its contents. Let those who up to now have painted icons without having learned to, who paint fancifully, without either practice or conformity to the image, have their works taken away from them and sold to simple and ignorant people in the villages for next to nothing: the painters of these icons will be obliged to learn from good masters. Whoever, by the grace of God, starts painting according to the image and the likeness, let him paint. Let the one from whom God has withheld such a gift abandon painting altogether, so that the name of God may not be blasphemed by such paintings. If anyone breaks this ruling, let him be punished by the Tsar and brought to judgment. If some people answer you this way, “This trade provides us with a living; it is our daily bread,’ do not be swayed by this objection because it is their ignorance that is speaking, and they do not feel guilty of any sin. Everyone cannot paint icons: God has given men various trades and professions, other than icon-painting. These other livelihoods are capable of feeding them and assuring their subsistence. The image of God must not be given to those who disfigure it and dishonor it. To paint on icons the Lord Sabaoth (that is, the Father) with a white beard holding the Only-Begotten Son in His lap with a dove between them is altogether absurd and improper, for no one has ever seen the Father in His Divinity. Indeed, the Father has no flesh, and it is not in flesh that the Son was born of the Father before all ages. And if the Prophet David says, ‘from the womb, before the morning star, I have begotten You’ (Ps. 109 :3), such a generation is certainly not corporeal, but unutterable and unimaginable. 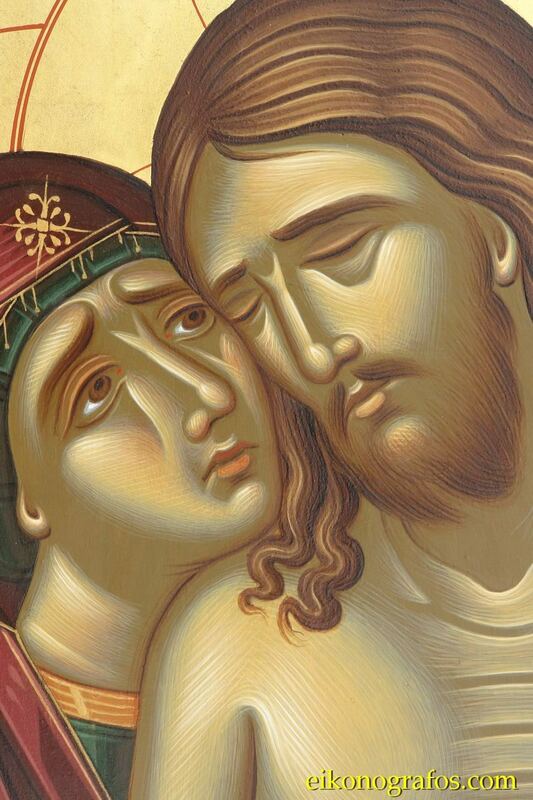 For Christ Himself says in the Holy Gospel, ‘No one knows the Father except the Son’. 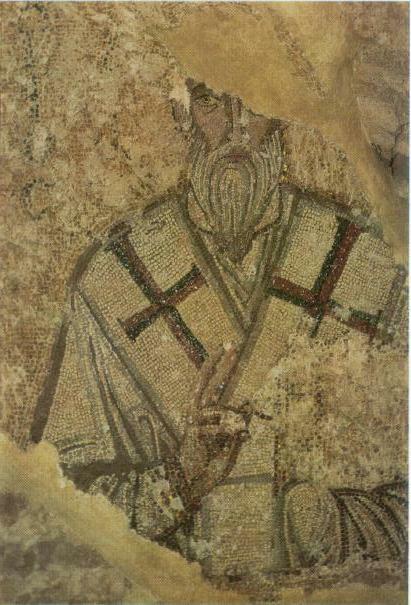 In chapter 40, Isaiah asks: ‘What likeness will you find for God or what form to resemble His?’ Likewise, the holy Apostle Paul says in chapter 17 of Acts: ‘Since we are God’s offspring, we ought not to believe that the Godhead is the same as gold, silver, or stone shaped by human art and thought.’ St. John of Damascus likewise says: ‘Who can make an imitation of God the invisible, the incorporeal, the indescribable, and unimaginable? To make an image of the Divinity is the height of folly and impiety.’ (On the Heavens, Bk. IV, On the Image) St. Gregory Dialogos forbade in a similar way. This is why the Lord Sabaoth, Who is the Godhead, and the engendering before all ages of the Only-Begotten Son of the Father must only be perceived through our mind. By no means is it proper to paint such images: it is impossible. And the Holy Spirit is not, in His nature a dove: He is by nature God. And no one has ever seen God, as the holy Evangelist points out. Nonetheless, the Holy Spirit appeared in the form of dove at the Holy Baptism of Christ in the Jordan; and this is why it is proper to represent the Holy Spirit in the form of a dove, in this context only. Anywhere else, those who have good sense do not represent the Holy Spirit in the form of a dove, for on Mount Tabor He appeared in the form of a cloud, and in another way elsewhere. Besides, Sabaoth is not the name of the Father only, but of the Holy Trinity. 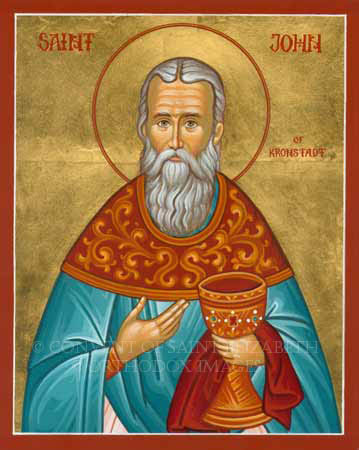 According to Dionysius the Areopagite, ‘Sabaoth’ is translated from the Hebrew as ‘Lord of Host’. And the Lord of Hosts is the Trinity. And if the Prophet Daniel says that he has seen the Ancient of Days sitting on the throne of judgment, that is not taken to mean the Father, but the Son at His Second Coming, who will judge all nations with his fearsome judgment. Likewise, on icons of the Holy Annunciation, they paint the Lord Sabaoth breathing from His mouth, and that breath reaches the womb of the Most Holy Mother of God. But who has seen this, or which passage from Holy Scripture bears witness to it? Where is this taken from? Such a practice and others like it are clearly adopted and borrowed from people whose understanding is vain, or rather whose mind is deranged or absent. This is why we decree that henceforth such mistaken painting cease, for it comes from unsound knowledge. It is only in the Apocalyspe of St. John that the Father can be painted with white hair, for lack of any other possibility, because of the visions contained in it. The council decreed that similar veneration and honour should be paid to the representations of the Lord and of the Saints as was accustomed to be paid to the “laurata” and tablets representing the Christian emperors, to wit, that they should be bowed to, and saluted with kisses, and attended with lights and the offering of incense. But the Council was most explicit in declaring that this was merely a veneration of honour and affection, such as can be given to the creature, and that under no circumstances could the adoration of divine worship be given to them but to God alone. The Greek language has in this respect a great advantage over the Hebrew, the Latin and the English; it has a word which is a general word and is properly used of the affectionate regard and veneration shown to any person or thing, whether to the divine Creator or to any of his creatures, this word is proskynesis ; it has also another word which can properly be used to denote only the worship due to the Most High, God, this word is latreia . When then the Council defined that the worship of “latria “was never to be given to any but God alone, it cut off all possibility for idolatry, mariolatry, iconolatry, or any other “latry” except “theo-latry.” If therefore any of these other “latries” exist or ever have existed, they exist or have existed not in accordance with, but in defiance of, the decree of the Second Council of Nice. But unfortunately, as I have said, we have neither in Hebrew, Latin, nor English any word with this restricted meaning, and therefore when it became necessary to translate the Greek acts and the decree, great difficulty was experienced, and by the use of “adoro” as the equivalent of proskyneo many were scandalized, thinking that it was divine adoration which they were to give to the sacred images, which they knew would be idolatry. The same trouble is found in rendering into English the acts and decrees; for while indeed properly speaking “worship” no more means necessarily divine worship in English than “adoratio” does in Latin (e.g. I. Chr. xxix. 20, “All the congregation bowed down their heads and worshipped the Lord and the King” [i.e. Solomon]; Luke xiv. 10, “Then shalt thou have worship in the presence of them that sit at meat with thee “), yet to the popular mind “the worship of images” is the equivalent of idolatry. In the following translations I have uniformly translated as follows and the reader from the English will know what the word is in the original. Proskyneo , to venerate; timao, to honour; latreuo, to adore; aspaxomai to salute; douleuo, to serve; eikon , an image. The relative force of proskynesis and latreia cannot better be set forth than by Archbishop Trench’s illustration of two circles having the same centre, the larger including the less (New Testament Synonyms, sub voce latreuo). To make this matter still clearer I must ask the reader’s attention to the use of the words abadh and shachah in the Hebrew; the one abadh, which finds, when used with reference to God or to false gods its equivalent in latreuo ; the other shachah, which is represented by proskyneo. Now in the Old Testament no distinction in the Hebrew is drawn between these words when applied to creator or creature. The one denotes service primarily for hire; the other bowing down and kissing the hand to any in salutation. Both words are constantly used and sometimes refer to the Creator and sometimes to the creature–e.g., we read that Jacob served (abadh) Laban (Gen. xxix. 20); and that Joshua commanded the people not to serve the gods of their fathers but to serve (abadh) the Lord (Josh. xxiv. 14). And for the use of shachah the following may suffice: “And all the congregation blessed the Lord God of their fathers and bowed down their heads and worshipped (Hebrew, shachah; Greek, proskyneo ; Latin, adoro) the Lord and the King” (I. Chr. xxix. 20). But while it is true of the Hebrew of the Old Testament that there is no word which refers alone to Divine Worship this is not true of the Septuagint Greek nor of the Greek of the New Testament, for in both proskyneo has always its general meaning, sometimes applying to the creature and sometimes to the Creator; but latreuo is used to denote divine worship alone, as St. Augustine pointed out long ago. I think I have now said enough to let the reader understand the doctrine taught by the council and to prove that in its decree it simply adopted the technical use of words found in the Greek of the Septuagint and of the New Testament. I may then close this introduction with a few remarks upon outward acts of veneration in general. 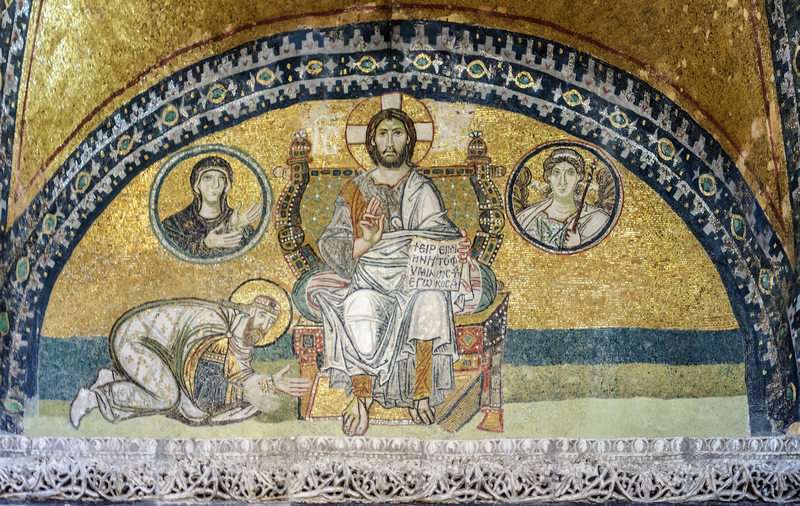 From the beginning, the Christian basilicas were adorned with mosaics or frescoes, at first in the apse, and very soon on the walls as well. Those in Gaul were lost together with the churches that housed them, and so we can only judge of them by contemporary descriptions and by surviving examples, especially in Italy, which was in close with Gaul at this time. The distinctive Byzantine style is already evident in the 5th century, and the 6th century is the age of an already developed and perfected art. 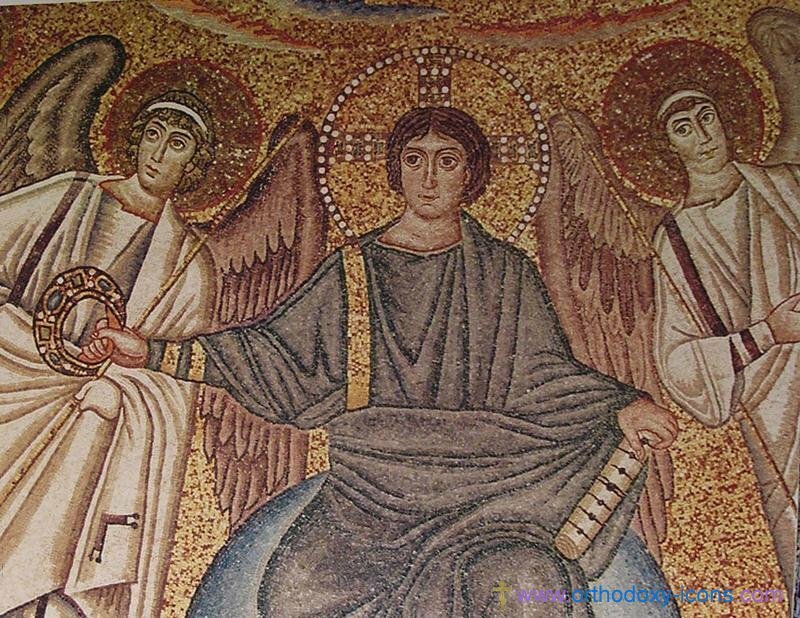 The great basilicas of Ravenna are monumental triumphs of Byzantine iconography – an art which in style and subject-matter has not changed essentially through the ages, and is still very much alive today. The Byzantine style was universal in the Roman Empire, as may be seen in the icons even of the remote border area of Mt. 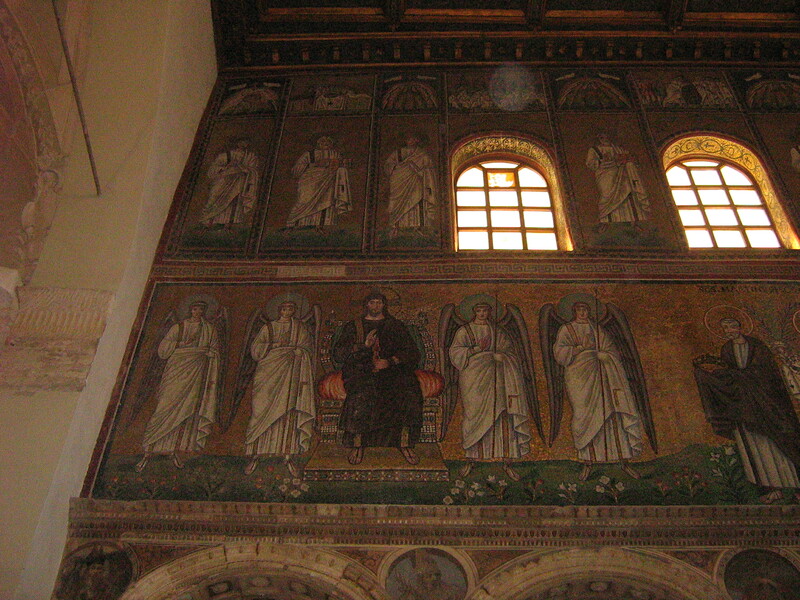 Sinai, where the mosaic of the Transfiguration in the apse is identical with later icons of the feast down to our day. This is the Christian art that was known to the great Western hierarchs of the 6th century, St. Gregory, Pope of Rome and St. Gregory of Tours. In Gaul, mosaic icons are known (History of the Franks 2.16; 10.45), but more commonly we hear of frescoes. 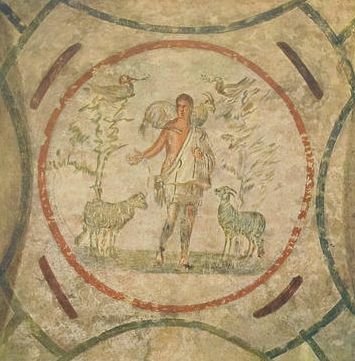 The original basilica of St. Martin had frescoes which were restored by St. Gregory, as he himself relates (HF 10.31): “I found the walls of St. Martin’s basilica damaged by fire. I ordered my workmen to use all their skill to paint and decorate them, until they were as bright as they had previously been.” These frescoes must have been impressive, for when treating of the stay of a certain Eberulf in the basilica (under the law of sanctuary which then prevailed), St. Gregory writes: “When the priest had gone off, Eberulf’s young women and his men-servants used to come in and stand gaping at the frescoes on the walls” (HF 7.22). St. Gregory has preserved for us a brief account of how the frescoes were painted (5th century): “The wife of Namatius built the church of St. Stephen in the suburb outside the walls of Clermont-Ferrand. She wanted it to be decorated with colored frescoes. She used to hold in her lap a book from which she would read stories of events which happened long ago, and the tell the workmen what she wanted painted on the walls” (HF 2.17). This “book” might have been the Scriptures, the Life of a saint, or even, as Prof. Dalton suggests, “some sort of painter’s manual like those used in the East” (vol. 1, p. 327). When restoring the main basilica of Tours (distinct from the basilica where Martin’s relics reposed), as Abbot Odo informs us precisely in his life of St. Gregory (ch. 12), the latter “decorated the walls with histories having for subject the exploits of Martin.” It so happens that we have a list of these iconographic scenes in a poem of Fortunatus describing the basilica (Carmine 10.6). They are: (1) St. Martin curing a leper by a kiss; (2) dividing his cloak and giving half to a beggar; (3) giving away his tunic; (4) raising three men from the dead; (5) preventing the pine tree from falling on him by the sign of the Cross; (6) idols being crushed by a great column launched from heaven; (7) St. Martin exposing a pretended martyr. We can only regret the disappearance of such a notable monument of Orthodox Christian art, just one of many in 6th-century Gaul, the likes of which were not seen in later centuries in the West (where the Roman-Byzantine style was gradually lost); but we may gain a general idea of its appearance in the contemporary basilicas of Ravenna with their mosaic icons. One of these basilicas, indeed, was dedicated originally to St. Martin of Tours, the dedication later being changed to Sant’ Apollinare Nuovo. Separate panel icons also existed at this time. 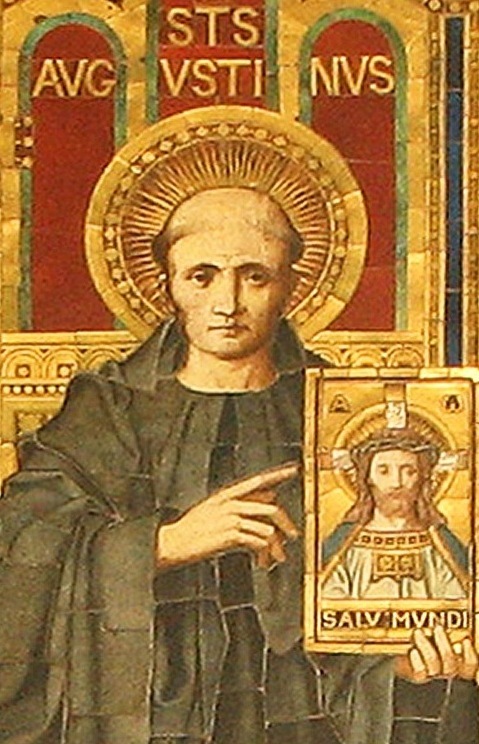 In the history of Bede it is stated that St. Augustine of Canterbury and those with him, after landing in Britain in the year 597, came to King Ethelbert of Kent “bearing a silver cross for their banner, and the image of our Lord and Savior painted on a board” (Ecclesiastical History of England, Book I, ch. 25). 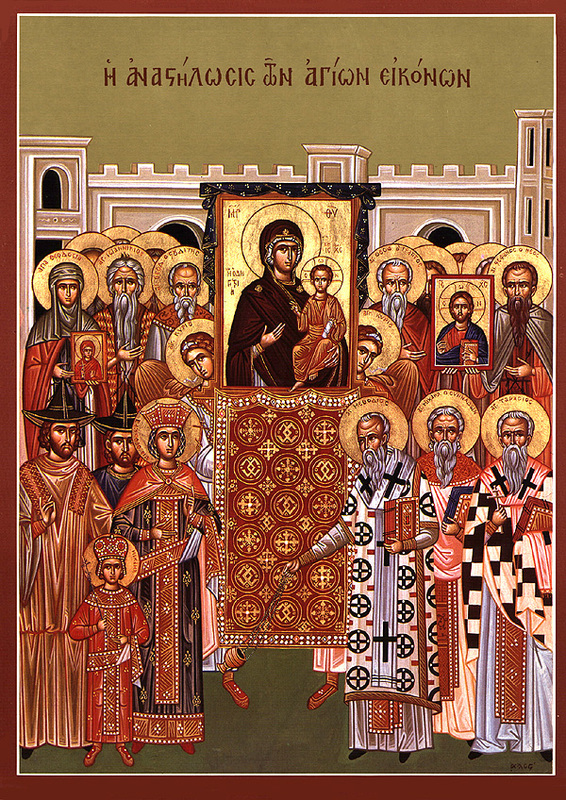 In the Life of the Fathers (12.2) we read of “the icons (Latin iconicas) of the apostles and other saints” in the oratory where St. Bracchio prayed. It should be noted that the oratories and small village churches of Gaul would not, of course, be in basilica style or usually made of stone; they were generally of wood, and the icons in them were painted on boards and hung on the walls. 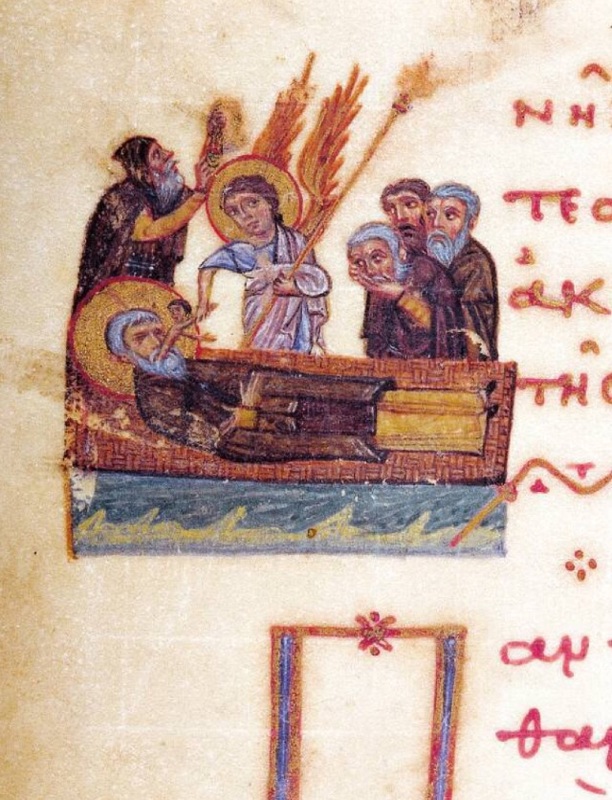 The most detailed reference to these 6th-century panel icons is in St. Gregory’s Glory of the Martyrs (ch. 22), where we read, in the account “of the Jew who stole an icon (Latin iconica, or in one manuscript, icona) and pierced it,” the following which is also an impressive testimony of the truly orthodox attitude of the Church of Gaul at that time, as contrasted with the iconoclast sentiment which seized part of Gaul (as it did also of the Christian East) in the century of Charlemagne. Here are St. Gregory’s words: “The faith which remained pure among us up to this day causes us love Christ with such a love that the faithful who keep His law engraved in their hearts wish to have also His painted image, in memory of His virtue, on visible boards which they hang in their churches and in their homes… a Jew, who often saw in a church an image of this sort painted on a board (Latin imaginem in tabula pictam) attached to the wall, said to himself, ‘Behold the seducer who has humiliated us’… Having come then in the night, he pierced the image, took it down from the wall, and carried it under his clothes to his house in order to throw it into the fire.” He was discovered when it was found that the image shed copious blood in the place where it had been pierced (a miracle which occurred also later in Byzantium with the Icon of the Iviron Mother of God, and in Soviet times in Kaplunovka in Russia with a crucifix). The aniconic policy of Western Christians provided the opportunity for rationalism to de-materialize the historical revelation of God in Christ, to mythologize the traditional Gospel of the Incarnation of God’s Son and Word, and even to deny the unbroken ontological unity of the Church. For Orthodox Christians, who have and use holy icons in our ecclesiastical life, the truth is not only metaphysical but also physical, not only theory but also history, not only word which is heard but also vision which is seen. Salvation is not only connected with the soul but also with the body, so that it does not separate spirit and flesh (matter), but, on the contrary, unifies them, incarnating or “materializing” the spirit and “spiritualizing” the flesh or matter by means of mystical and saving communion which incurs no confusion. The grace of salvation, deification, union with God through participation in His uncreated energies, embraces the entire human being, the inner and the outer man, i.e. the mind and the reason of the inner man as well as the vision and the hearing of outer man. If the authentic spirit of Orthodoxy is not transmitted to us like this, there is a temptation for us to be following “external wisdom,” the wisdom of this world. 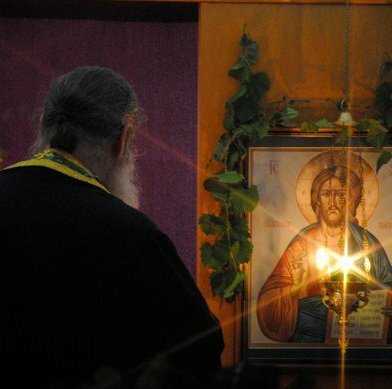 We will then, in coming to Orthodoxy, go after external things: good icons, beautiful Church services according to the Typicon, just the right kind of chanting, tithing, having beautiful churches…. All these things are wonderful and good, but we can approach them without placing first a warm, Christian heart and a struggle with ourselves whereby we are made humble. If we neglect this essential priority, then all these wonderful external things can, as the philosopher Vladimir Solovyev describes, be put in a museum of Orthodox antiquities—and the Antichrist will love this. If you get all excited about having the right kind of icons and begin saying, “There’s an icon of the wrong style in your church! ” you must check yourself and be more careful, because you are again placing all your emphasis on something external. In fact, if there is a church with nothing but icons of the latest “approved” style, one might justifiably regard it with suspicion. 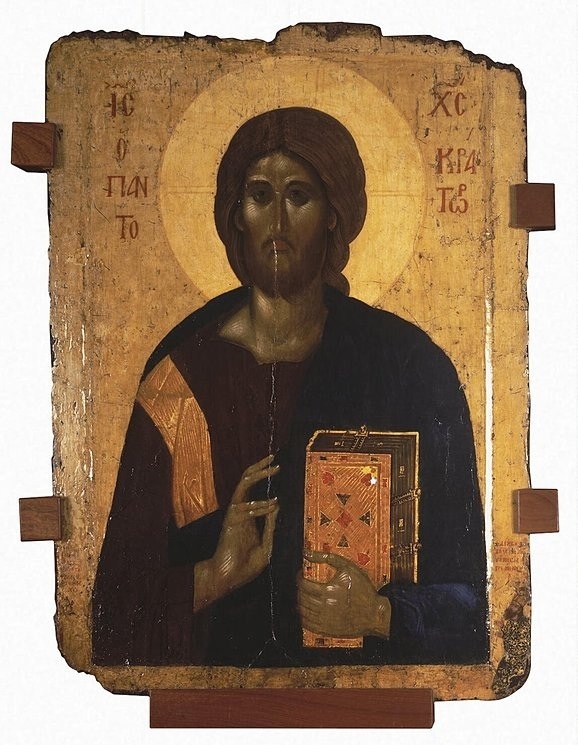 There is a case (one of many) in which a church had old, original Russian icons—some good and some in rather poor taste, painted in a relatively new style—and a zealous person took them all out and put in new, “traditional” style paper icon prints. And what was the result? The people there lost contact with tradition, with the people who gave them Orthodoxy. They removed the original icons which believers had prayed before for centuries. Christianity contains nothing untried and abnormal. The very use of sacred images belongs to an ancient tradition, as worthy examples of faith have testified. 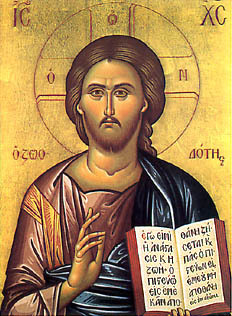 The first example is that of the image of our Lord Jesus Christ, sent to King Abgar; this image on a wooden tablet showed the outlines of His bodily form, similar to images painted with colors. The second example is that of the image not painted by human hands (acheropita) of her who gave birth without seed: it is found at Lidda, a city also called Diospolis. 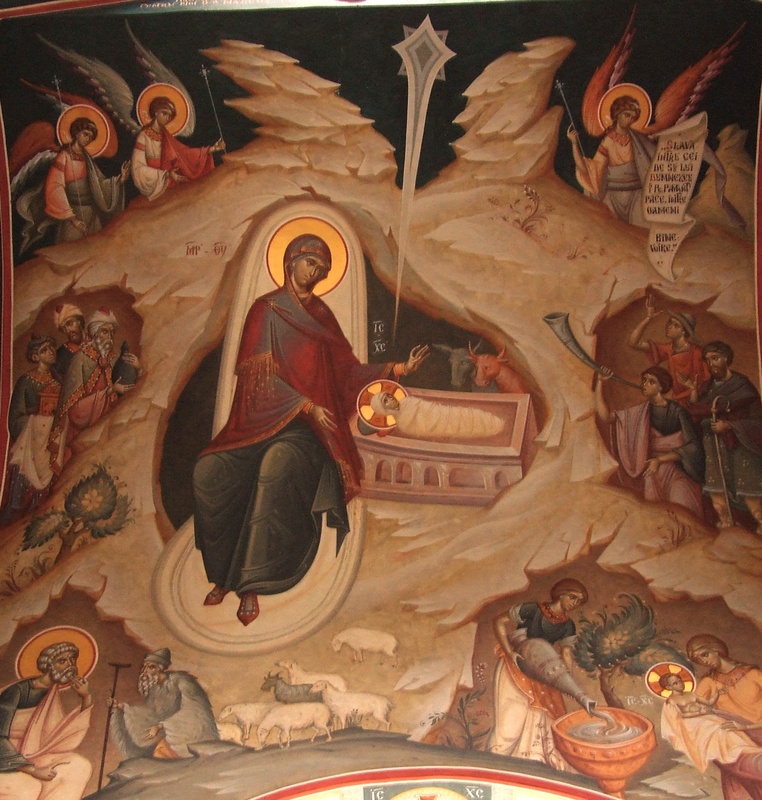 The image is painted in very bright colors and shows the body of the Mother of God, three cubits in height. It was venerated in the time of the apostles on the western wall of the temple that they built. It is so finely done that it appears to have been produced by the hand of a painter. It clearly shows her purple habit, her hands, her face, and all of her outward form, as can still be affirmed today. They say that Julian, that apostate and enemy of Christ, heard about the painting, he wanted to know more about it. So he sent some Jewish painters [to examine it], who informed him that it was genuine; Julian, dumbfounded, had no desire to investigate further. It is told that the temple was constructed when the Mother of God was still living. Going up to Zion, where she lived, the apostles said to her, “Where were you, Lady? We have built you a house at Lidda.” Mary answered them, “I was with you, and I am still with you.” Returning to Lidda and entering the temple, they found her complete image there, as she had told them. This is what an ancient local tradition has testified from the beginning, and the tradition lives today. First-because our faith is light. Christ said: I am the light of the world (John 8:12). The light of the vigil lamp reminds us of that light by which Christ illumines our souls. Second-in order to remind us of the radiant character of the saint before whose icon we light the vigil lamp, for saints are called sons of light (John 12:36, Luke 16:8). Third-in order to serve as a reproach to us for our dark deeds, for our evil thoughts and desires, and in order to call us to the path of evangelical light; and so that we would more zealously try to fulfill the commandments of the Saviour: “Let your light so shine before men, that they may see your good works” (Matt. 5:16). Fourth-so that the vigil lamp would be our small sacrifice to God, Who gave Himself completely as a sacrifice for us, and as a small sign of our great gratitude and radiant love for Him from Whom we ask in prayer for life, and health, and salvation and everything that only boundless heavenly love can bestow. Fifth-so that terror would strike the evil powers who sometimes assail us even at the time of prayer and lead away our thoughts from the Creator. The evil powers love the darkness and tremble at every light, especially at that which belongs to God and to those who please Him. Sixth-so that this light would rouse us to selflessness. Just as the oil and wick burn in the vigil lamp, submissive to our will, so let our souls also burn with the flame of love in all our sufferings, always being submissive to God’s will. Seventh-in order to teach us that just as the vigil lamp cannot be lit without our hand, so too, our heart, our inward vigil lamp, cannot be lit without the holy fire of God’s grace, even if it were to be filled with all the virtues. All these virtues of ours are, after all, like combustible material, but the fire which ignites them proceeds from God. Eighth-in order to remind us that before anything else the Creator of the world created light, and after that everything else in order: And God said, let there be light: and there was light (Genesis 1:3). And it must be so also at the beginning of our spiritual life, so that before anything else the light of Christ’s truth would shine within us. From this light of Christ’s truth subsequently every good is created, springs up and grows in us. 516. What is a graven image, as spoken of in the second commandment? The commandment itself explains that a graven image, or idol, is the likeness of some creature in heaven, or earth, or in the waters, which men bow down to and serve instead of God their Maker. 517. What is forbidden, then, by the second commandment? We are forbidden to bow down to graven images or idols, as to supposed deities, or as to likenesses of false gods. 518. Are we not hereby forbidden to have any sacred representations whatever? By no means. This very plainly appears from hence, that the same Moses through whom God gave the commandment against graven images, received at the same time from God an order to place in the tabernacle, or movable temple of the Israelites, sacred representations of Cherubim in gold, and to place them, too, in that inner part of the temple to which the people turned for the worship of God. 519. Why is this example worthy of remark for the Orthodox Christian Church? Because it illustrates her use of holy icons. 520. What is an icon? The word is Greek, and means, an image or representation. 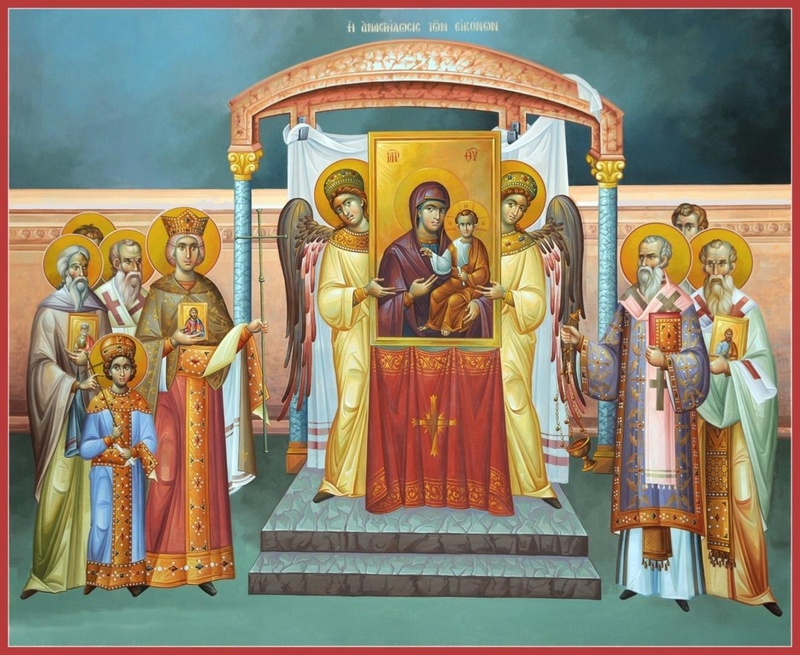 In the Orthodox Church this name designates sacred representations of our Lord Jesus Christ, God incarnate, his immaculate Mother, and his saints. 521. 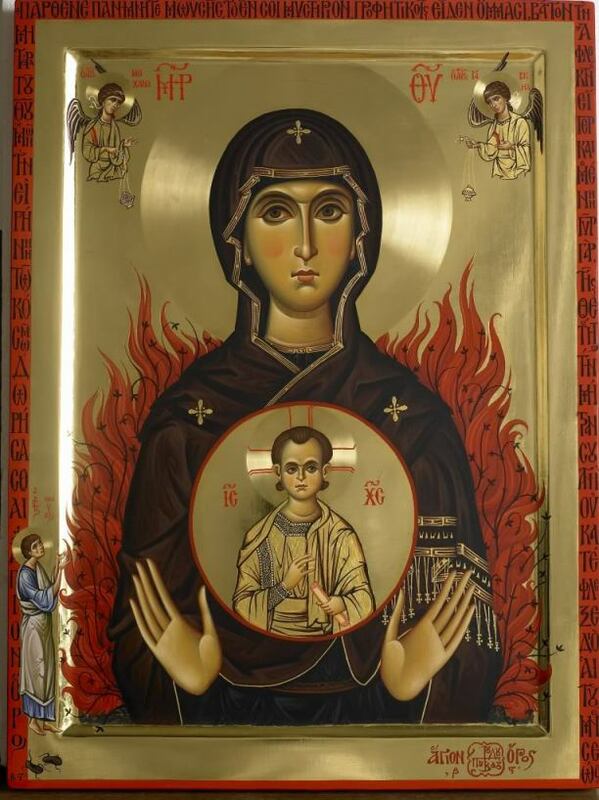 Is the use of holy icons agreeable to the second commandment? 522. What disposition of mind should we have when we reverence the icons? It is not in writing only that they have bequeathed to us the Tradition of the Church, but also in certain unwritten examples. 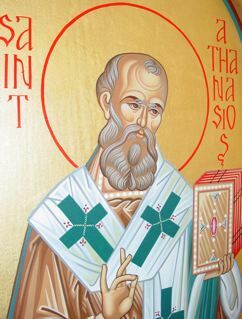 In the twenty-seventh book of his work, in thirty chapters addressed to Amphilochios concerning the Holy Spirit, St Basil says, “In the cherished teaching and dogmas of the Church, we hold some things by written documents; others we have received in mystery from the apostolical tradition. Both are of equal value for the soul’s growth. No one will dispute this who has considered even a little the discipline of the Church. 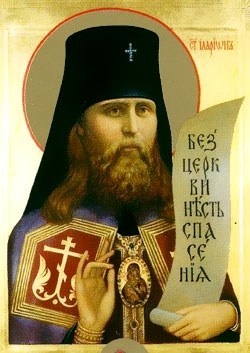 For if we neglect unwritten customs, as not having much weight we bury in oblivion the most pertinent facts connected with the Gospel.” These are the great Basil’s words. How do we know the Holy place of Calvary, or the Holy Sepulchre? Does it not rest on a tradition handed down from father to son? It is written that our Lord was crucified on Calvary, and buried in a tomb, which Joseph hewed out of the rock; (Mt. 27:60) but it is unwritten tradition which identifies these spots, and does more things of the same kind. Whence come the three immersions at baptism, praying with face turned towards the east, and the tradition of the Mysteries? Hence St Paul says, “Therefore, brethren, stand fast, and hold the traditions which you have learned either by word, or by our epistle.” (II Thess. 2.15) As, then, so much has been handed down in the Church, and is observed down to the present day, why disparage images? “Iconography began on the day our Lord Jesus Christ pressed a cloth to His face and imprinted His divine-human image thereon. 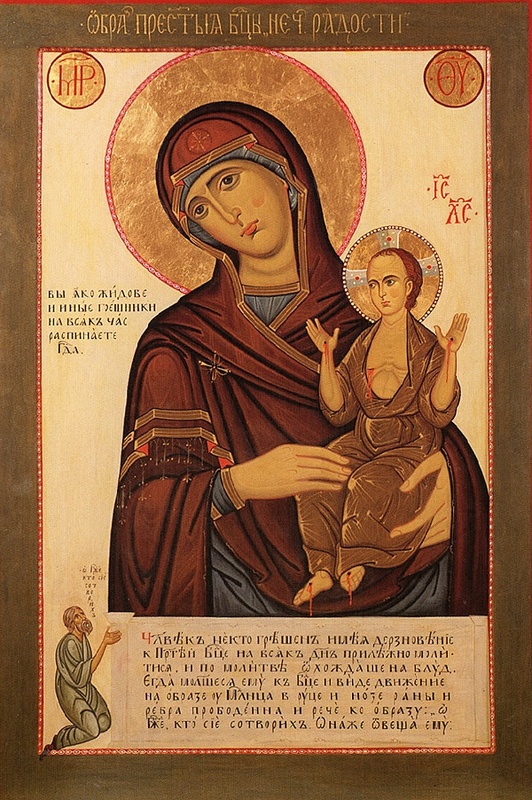 According to tradition, Luke the Evangelist painted the image of the Mother of God; and, also according to tradition, there still exist today many icons which were painted by him. An artist, he painted not only the first icons of the Mother of God, but also those of the Holy Apostles Peter and Paul and, possibly, others which have not come down to us. Icons are precisely the union between painting and those symbols and works of art which replaced icons during the time of persecution. The icon is not simply a representation, a portrait. In later times only has the bodily been represented, but an icon is still supposed to remind people of the spiritual aspect of the person depicted. 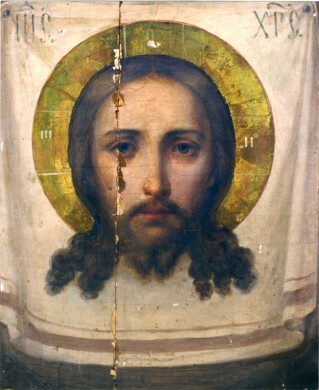 An icon is an image which leads us to a Holy, God-pleasing person, or raises us up to Heaven, or evokes a feeling of repentance, of compunction, of prayer, a feeling that one must bow down before this image. 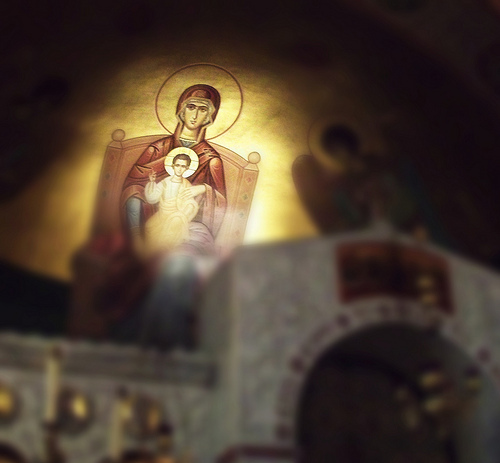 The value of an icon lies in the fact that, when we approach it, we want to pray before it with reverence. If the image elicits this feeling, it is an icon. The limitless power of God dwells in the Cross, just as it resided in an incomprehensible way in the Ark which was venerated amidst great honor and awe by the Jewish people, performing by it miracles and awesome signs in the midst in the midst of those who were not ashamed to call it ‘God’ (see Num. 10:35-36, where Moses addresses the Ark as ‘Lord’) that is, they would gaze upon it in awe as though God, because the glory of God’s honored name was upon it. The Ark was honored with this name not only by Jewish people, but by foreign peoples, their enemies: “Woe to us, for the God of the People has come to the camp today”. (cf. 1 Sam. 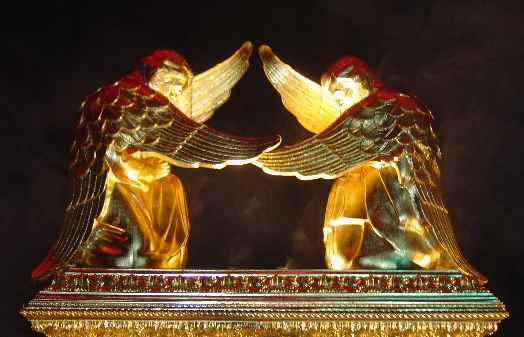 4:7) That power which existed in the Ark is believed by us to exist in this revered form of the Cross, which we hold in honor in great awareness of God. Did not Moses and the People prostrate before the Ark in great awe and trembling? Did not Joshua the son of Nun lie stretched out on his face before morning until evening? (Jos. 7:6) Were not God’s fearsome revelations manifested there, as if to afford honor to this object, seeing that the Shekhina of God was residing in it? To make our confession short, we keep unchanged all the ecclesiastical traditions handed down to us, whether in writing or verbally, one of which is the making of pictorial representations, agreeable to the history of the preaching of the Gospel, a tradition useful in many respects, but especially in this, that so the incarnation of the Word of God is shown forth as real and not merely phantastic, for these have mutual indications and without doubt have also mutual significations. Those, therefore who dare to think or teach otherwise, or as wicked heretics to spurn the traditions of the Church and to invent some novelty, or else to reject some of those things which the Church hath received (e.g., the Book of the Gospels, or the image of the cross, or the pictorial icons, or the holy reliques of a martyr), or evilly and sharply to devise anything subversive of the lawful traditions of the Catholic Church or to turn to common uses the sacred vessels or the venerable monasteries, if they be Bishops or Clerics, we command that they be deposed; if religious or laics, that they be cut off from communion. 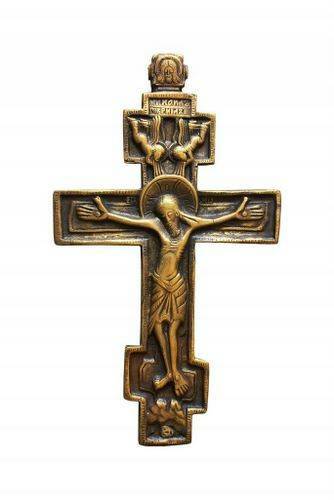 “According to pious tradition, the size of the Cross of Christ was fifteen feet in height and eight feet in length. 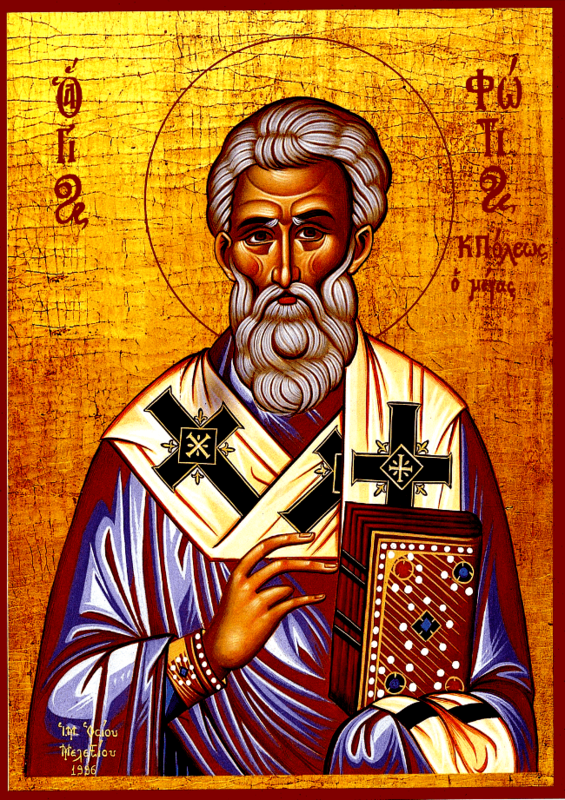 St. Cyril of Jerusalem (444 AD) writes: “The whole world has now been filled with pieces of the wood of the Cross” (Catachesis 4:10). He makes this statement no less than three times in his lectures to the catechumens of Jerusalem. 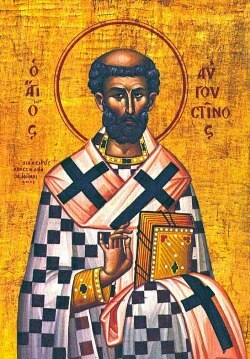 St. John Chrysostom in the same century tells us that fragments of the True Cross were kept in golden reliquaries, which men reverently wore upon their persons. In 1889 two French archaeologists, Letaille and Audollent, discovered in the district of Sétif an inscription of the year 359 in which, among other relics, is mentioned the sacred wood of the Cross. Another inscription, from Rasgunia (Cape Matifu), somewhat earlier in date than the preceding, mentions another relic of the Cross. The work of Rohault de Fleury, “Mémoire sur les instruments de la Passion” (Paris, 1870), deserves more prolonged attention; its author has sought out with great care and learning all the relics of the True Cross, drawn up a catalogue of them, and, thanks to this labour, he has succeeded in showing that, in spite of what various Protestant or Rationalistic authors have pretended, the fragments of the Cross brought together again would not only not ‘be comparable in bulk to a battleship’, but would not reach one-third that of a Cross which has been supposed to have been three or four metres in height, with transverse branch of two metres, proportions not at all abnormal (op. cit., 97-179). Here is the calculation of this savant: Supposing the Cross to have been of pine-wood, as is believed by the savants who have made a special study of the subject, and giving it a weight of about seventy-five kilograms, we find that the volume of this Cross was 178,000,000 cubic millimetres. Now the total known volume of the True Cross, according to the finding of M. Rohault de Fleury, amounts to above 4,000,000 cubic millimetres, allowing the missing part to be as big as we will, the lost parts or the parts the existence of which has been overlooked, we still find ourselves far short of 178,000,000 cubic millimetres, which should make up the True Cross. There are two primary ways to properly display the Christian cross. 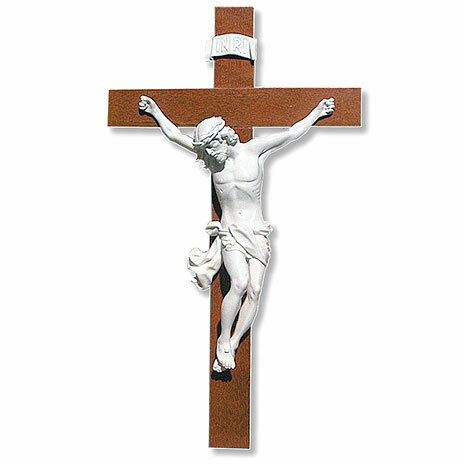 The first is with Christ on the cross, with the skull of Adam underneath His feet. In this we see both His willingness to submit as man, being the victim of sinful humanity, as well as His victory over death, that of which He died for: to conquer death’s hold on us. The second way to properly display the Christian cross is with no Christ on it at all, implying His resurrection (victory over death). Although, if the cross is without Christ portrays a rather dull and rather confusing theology, in my opinion, and this is why I prefer that the ‘Christless crosses’ have additional symbolic/iconic theology with them. 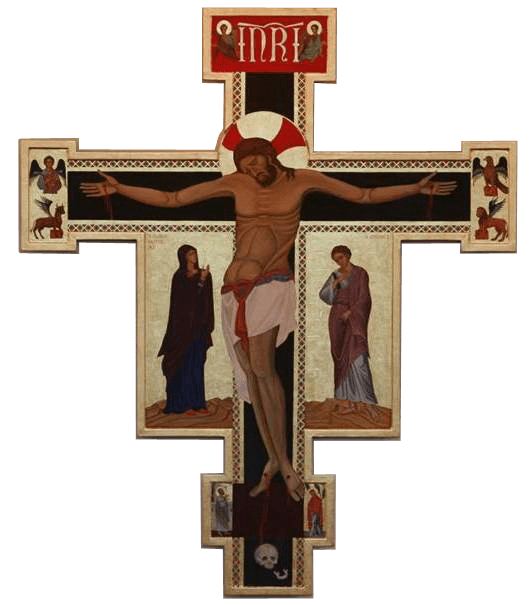 This leaves us with the popular Roman and Lutheran crosses that have only the crucified Christ on them, with no Theotokos, no angels, no skull, usually nothing else at all. This presents us with a very legal and juridical theology; that Christ died for the sake of the Law (sacrifice is all we see in this one). Most all Western Christianity teaches that Christ died for the Law; that He died to take the punishment that the Law demands from us. But this is not what Christ died for. The Law, as Saint Paul says, was a tutor to show the Jews Christ, and that salvation is not from the Law. The penal aspect of God’s Law is not the means or springboard of salvation. The Bible does not teach through the Church that the penal aspect of the Law works salvation, but only teaches this through the doctrines of man. Saint Paul says in Philippians 2:8 that Christ obediently became man to the point of death. This is referring to his obedience to human nature and not to the Law. Christ had to experience all that we would or could experience in order to be the “ransom” and beat death’s hold on our eternal glory and communion with God. There has never been a “covenant of works,” as some teach, and salvation was never through works, even in the Old Covenant era. Saint Paul attests to this in Romans 4, where he says that Abraham was a part of God’s Covenant not through works but through faith. A legal transaction, as Western theology supposes, did not need to take place. In fact, it goes completely against the gospel to say that the cross was a part of a legal transaction; that God was reckoning Christ to earn salvation through works! God was not punishing Christ on the cross to end this supposed legal transaction. Christ was fully man and fully God and living this dual nature here on earth found Jesus on the cross! Christ becomes both the victim as well as the victor through the cross, being killed yet conquering death and its stronghold. In this work Tertullian in his Montanist period attacks a North African or Roman bishop of the Church for absolving Christians of adultery. He believed this to be wrong due to Montanist rigorism. 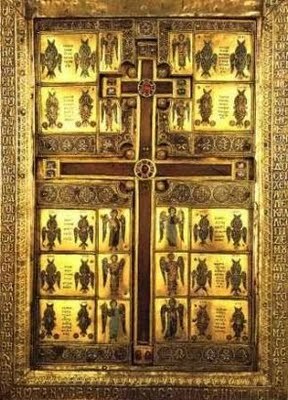 This is the oldest proof that the catholic Church made use of images in it’s liturgy and in concert with it’s Mysteries. 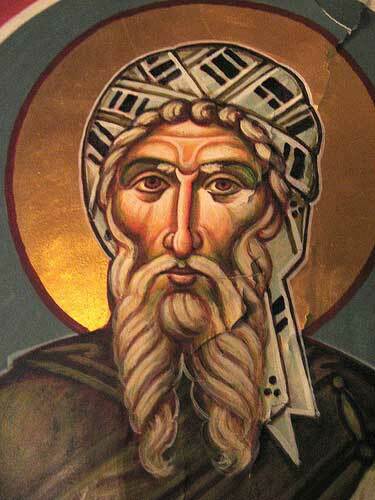 Tertullian was so rigorous that at times he linked all images with idolatry. The Marcionites asked how was it possible to reconcile Old Tetstament images with a rigorist interpretation of the second commandment. They rejected the Old Testament God altogether thus avoiding the problem for them. Tertullian had to counter their assertions by creating a special class of images which could manifest the power of what they prefigured. And besides this, he caused to be painted on a lofty tablet, and set up in the front of the portico of his palace, so as to be visible to all, a representation of the salutary sign placed above his head, and below it that hateful and savage adversary of mankind, who by means of the tyranny of the ungodly had wasted the Church of God, falling headlong, under the form of a dragon, to the abyss of destruction. For the sacred oracles in the books of God’s prophets have described him as a dragon and a crooked serpent; and for this reason the emperor thus publicly displayed a painted resemblance of the dragon beneath his own and his children’s feet, stricken through with a dart, and cast headlong into the depths of the sea. And being fully resolved to distinguish the city which bore his name with especial honor, he embellished it with numerous sacred edifices, both memorials of martyrs on the largest scale, and other buildings of the most splendid kind, not only within the city itself, but in its vicinity: and thus at the same time he rendered honor to the memory of the martyrs, and consecrated his city to the martyrs’ God. Being filled, too, with Divine wisdom, he determined to purge the city which was to be distinguished by his own name from idolatry of every kind, that henceforth no statues might be worshiped there in the temples of those falsely reputed to be gods, nor any altars defiled by the pollution of blood: that there might be no sacrifices consumed by fire, no demon festivals, nor any of the other ceremonies usually observed by the superstitious. Filed Under: All, Bede the Venerable ca. 673-735, Holy Fathers, iconography, St. Augustine of Canterbury 6th cent. Because one of the intellectual defaults of our longstanding culture seems to be that of following hard and fast rules and keeping things as simple as possible, the more theological matters of the Bible, for instance, can encounter fierce opposition as they begin to take dominion over society; especially if they involve both heaven as well as earth. The intellectual default seems to be that of creating division between heaven and earth, completely separating the visible from the invisible. But this is not what Christ taught us. All the earth is God’s and when a priest prays over a certain part of God’s matter to be set apart for veneration, God takes dominion of that matter. God’s blessing sets apart His matter for His specified purpose. Matter matters, as we can see with Christ as well as the Apostles – remember when people were being healed from Saint Peter’s garments, for instance? God desires that the kingdom be “ON EARTH AS IT IS IN HEAVEN!” Sound familiar? It should, because those are the words of Christ! It has been supposed by many that iconography is a result of the Byzantine Empire and the so-called heretical and apostate culture of the Church from that point into the rest of Orthodox history. But iconography has been a practice that the Church has embraced since its earliest times. Although iconography escalated in the 4th century, after the Nicene Council and Constantine established the Byzantine Empire, we have evidence of pre-Nicaea icons within the catacombs, showing that iconography is not simply a result of the period of Constantine. 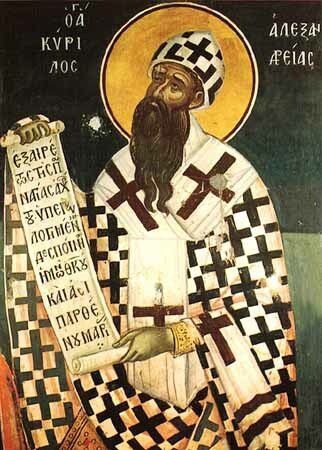 Saint Irenaeus (A.D. 130–202) mentions icons in his Against Heresies, condemning the improper use of icons by the Gnostics. From the earliest times of the Church images of the saints were painted by and for the Church. Icons were primarily a tool of evangelism and doctrinal proclamation, but it seems that as they began to do their job those that recognized the revelation behind the icons began to teach others that this recognition was much more than a mental discovery, but more of a spiritual awakening to the wonders that are happening within the realm of heaven itself. 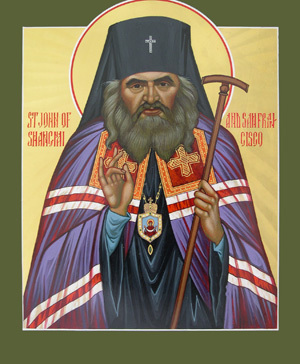 St. John of Damascus wrote: “We are led by perceptible Icons to the contemplation of the divine and spiritual” (PG 94:1261a). This proclamation that the icons were more than what the novice eye sees began to stir much controversy. 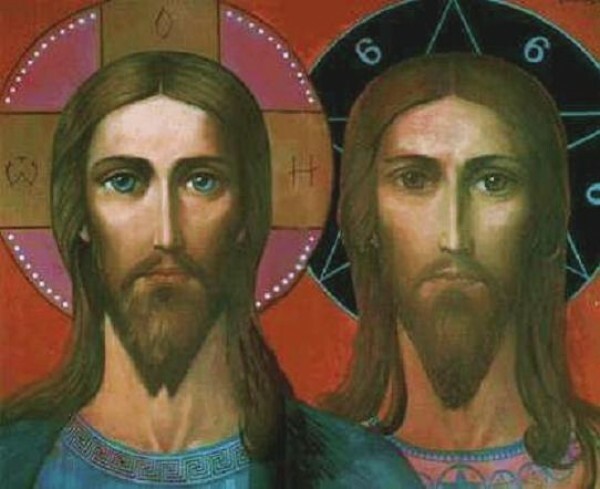 There were many western Christians that opposed such views of the icons, believing that such recognition of matter giving off such holiness was idolatrous. 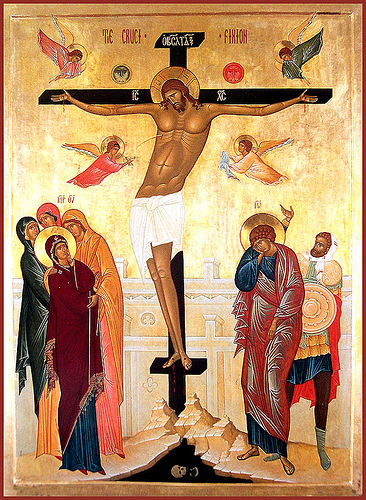 Western Christianity was certainly the instigator of iconoclasm (anti-icon). 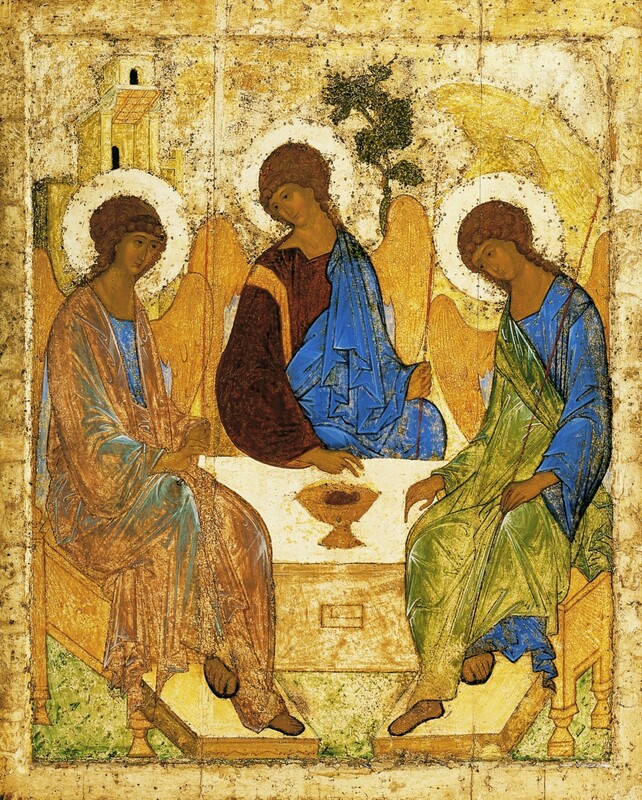 A western council, the Synod of Elvira (c.305) was one of the earliest movements to prohibit icons: “lest that which is worshiped and venerated be depicted on the walls.” One of the earliest iconoclastic quotes in existence would likely be the third century teaching of Tertullian, who was known to have many heretical viewpoints: “Likewise, when forbidding the similitude to be made of all things which are in heaven, and in earth, and in the waters, He declared also the reasons, as being prohibitory of all material exhibition of a latent idolatry.” (Against Marcion Bk. 2. 22) Tertullian was at one point an orthodox clergyman and gained a powerful influence in the west, so it is likely that this teaching carried much weight for future iconoclasm. With the approval of the use of images by the Trullan Synod (A.D. 692) of the Third Council of Constantinople, the debate was joined again. In this council it was decreed that Christ was not to be depicted merely as a lamb but in human form, “so that we may perceive through it the depth of the humiliation of God the Word and be led to the remembrance of His life in the flesh, His passion and His death, and of the redemption which it brought to the world.” The use of icons began to gain more ground and within a short period, in 726 Emperor Leo III, the Syrian (717-741) initiated the fight to overthrow the sacred images of the Byzantine Empire. 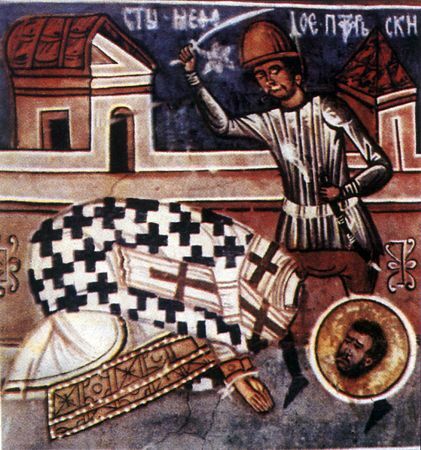 This is what the Church had to deal with as a monarchial ministry; the relationship with the state was primed by the Apostles and Martyrs, given flight by Constantine and the Bishops of the Nicaean Council, but not to encounter a number of violent storms such as this controversy between the iconoclasts (those opposing icons) and iconodules (those advocating icons). The effects of iconoclasm were so devastating that they can be seen as comparable to the Arian controversy and the Monophysite conflict. 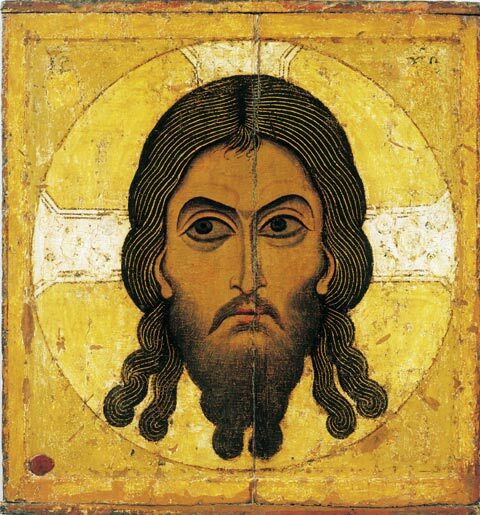 At the beginning of Leo’s initiative – which is said to have been a personal vendetta of Leo, perhaps due to his Monophysite background – Leo decided to prompt a very radical act by ordering the destruction of the icon of Christ over the bronze doors if the imperial palace. There were some women that overturned the ladder of the workers that were engaged in the desecration, which then provoked a riot with several deaths. The women were arrested and condemned to lashing, mutilation and exile. Amidst the emperors initiatives, the patriarch of Constantinople, Germanus, began to defend iconography and stated: “In eternal memory of the life in the flesh or our Lord Jesus Christ, of His passion, of His saving death and the redemption of the world, which result from them, we have received the tradition of representing Him in His human form, that is, His visible theophany, understanding that in this way we exalt the humiliation of God the Word.” Leo eventually stopped recognizing Germanus as the patriarch and assigned the emperors chaplain as patriarch. Bishops in the west, including Gregory II of Rome, refused to recognize the new patriarch. 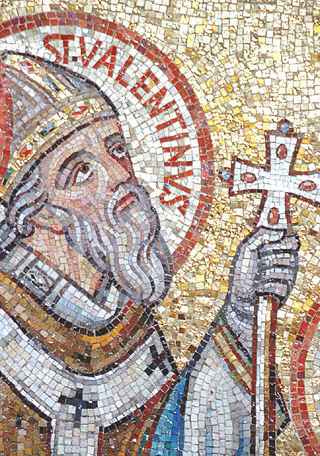 Gregory II died and was succeeded by Gregory III who formed a synod at Rome to excommunicate the iconoclasts, anyone who refused to honor the ancient custom of the Church. This infuriated Leo, who then sent a fleet to Italy, only to be destroyed by storms. After Leo died, his son, Constantine V, proceeded to the throne and called a council in 754 at Hiereia. The council was not ecumenical nor was it even attended by the Oriental bishops or the bishop of Rome. The council proclaimed that the creating and venerating of icons is to be condemned. By summoning this council iconoclasm became the official dogma of the entire Eastern Church. Many monks, laymen and clergy railed against this and were tortured and publically beheaded, including the Patriarch Constantine in 776. 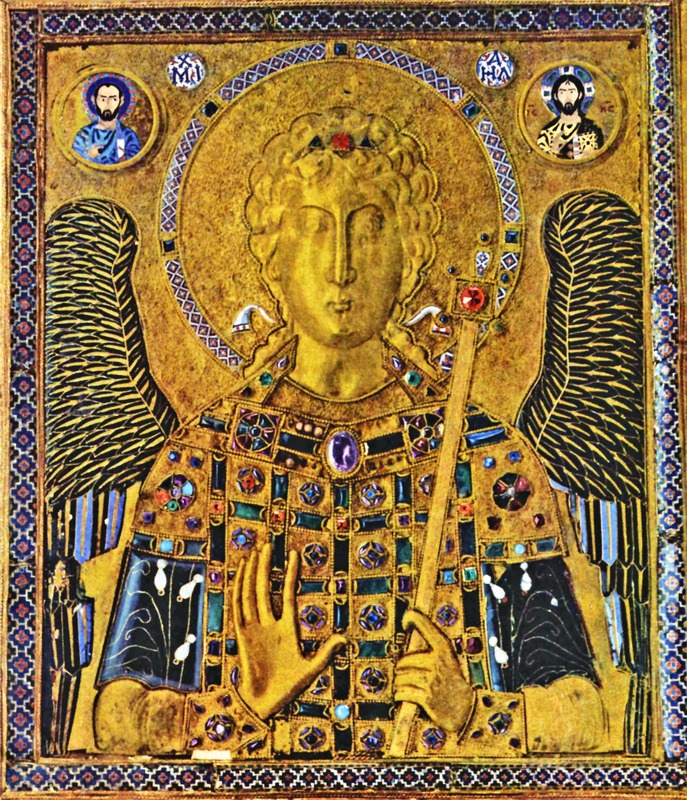 After the death of the emperor Constantine V, Leo IV ascended to the thrown. Leo married Irene, a very influential woman who at the command of Patriarch Paul began to communicate with the Roman bishop to form a council. In September 24 of 787 the council of Nicaea II was formed, meeting at the Basilica of the holy Apostles in Constantinople. 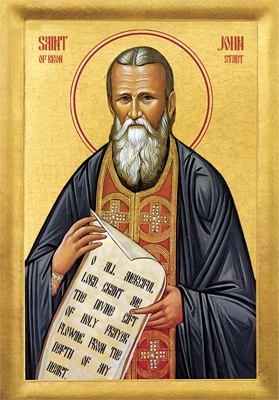 Nicea II declared icon veneration to be the orthodox and iconoclasm to be condemned as a heresy, and the destruction of all iconoclastic writings is ordered. The second phase of the iconoclastic controversy is dated 815-843 which began with the rise of Leo V as emperor, who reverted to iconoclasm. At a council in Hagia Sophia in Constantinople, in 815, Nicaea was repudiated and the decrees of the Iconolasts of 754 were declared to be the faith of the empire. But only five years later Leo V was assassinated in front of the altar of Hagia Sophia. Leo V was replaced by Michael II who refused to allow the return of iconography or even it very discussion. A number of prominent bishops and monks joined the Patriarch and vowed to fight iconoclasm even to death itself. Michael ordered that prominent, low-hanging icons in the Temple used for veneration be removed. 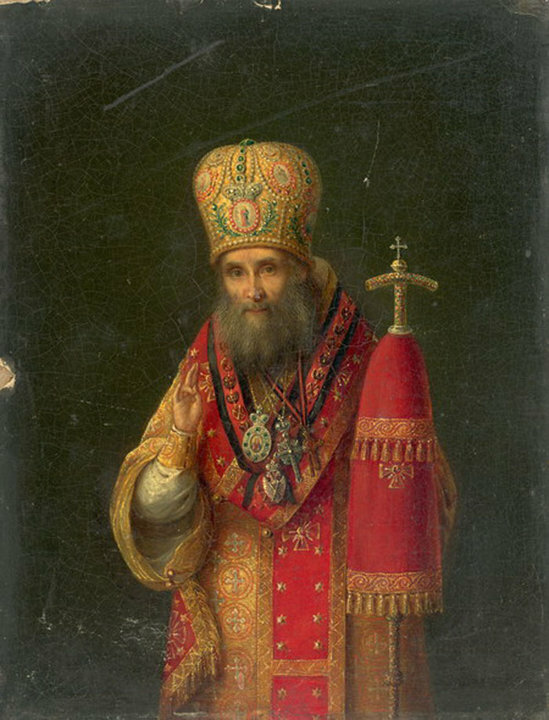 Patriarch Nicephorus refused and was deported to Asia Minor where he eventually resigned his office. Michael’s son, Theophilus, assumed the throne in 829, and severely persecuted iconodules. 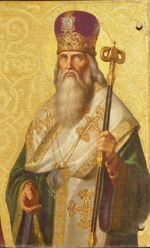 He died in 842 and his power passed to his mother – due to the successor being only three years old – Theodora, who then elected an iconodule as Patriarch: Methodius. Patriarch Methodius declared sacred images to be lawful and condemned iconoclasm. 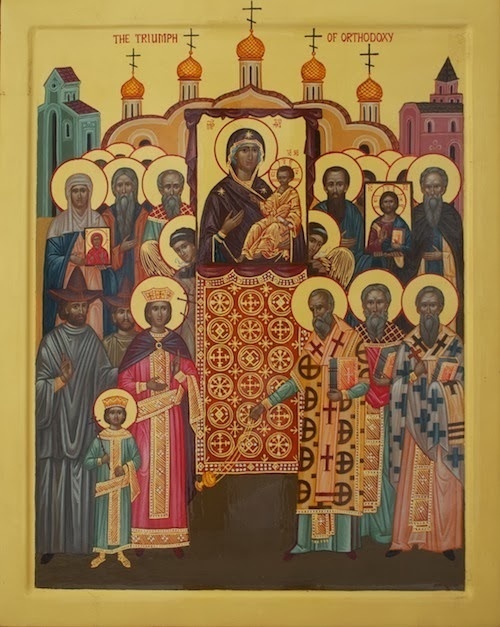 Icons are lawful to this day within the Orthodox Church thanks to the struggle of these many saints. 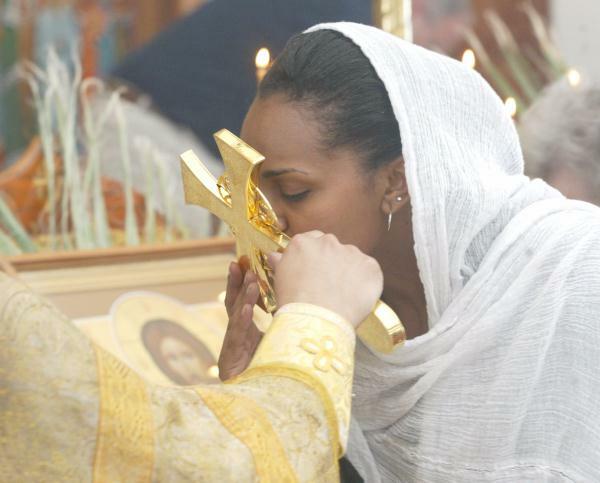 We honor their accomplishments on the first Sunday in Great Lent, Orthodox Sunday, with a procession of icons! Icons, a part of the Christian faith that have been very misunderstood by many people, are a sure way to cleanse the mind and heal the soul! Certainly, there have been a number of abuses with the use of icons but this does not make icons unorthodox. Let’s take a look at reason, Scripture and tradition (history) to see that icons are extremely useful for the Christian walk! First, icons have been used as early as the first century. When the Christians worshipped in the catacombs, while hiding from the emperor’s men, they drew icons on the walls. Recent discovery of some first century documents carved in metal aslo show that the Church heavily embraced icons. Icons were a part of early Church worship! Rome has recently uncovered icons of the apostles that were believed to have been painted around 300 A.D. in the catacombs of Italy. The picture to the left is of St. Paul! Remember, the early church worshiped in an atmosphere of icons and displayed corpses of their fellow saints. Back then, the people of God were known as the very body of Christ, so paintings of Christians as well as their remains were not unusual to them. They were reverenced with humility and generosity. I think I am going to grow my beard like St. Paul’s. That looks really cool;) Not sure about the bald top though. That will probably come about in due season for me! Be Bold, Show the Cross! There are a variety of modern Christian churches out there that are following the paths of the cults, claiming that there is little to no symbolic nature in the Bible and that we should not use the cross as a symbol because it represents murdering Christ. My old Evangelical church used a dove instead, representing the Holy Spirit. This is fine but don’t claim that using the cross is somehow ungodly or not as effective for conversions. 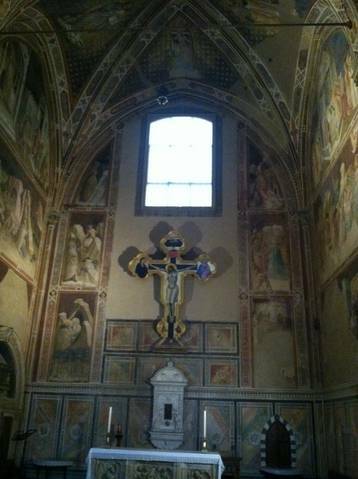 The Church has been using the cross for two thousand years. What makes them so inclined to suddenly halt this tradition for another more feminine solution? 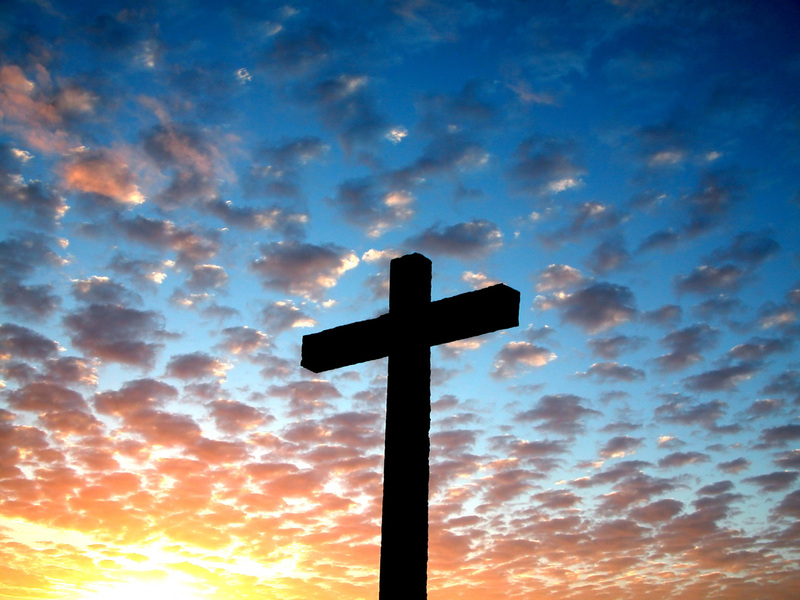 We should not be fearful of using the cross to demonstrate our faith. The cross represents how Christ became man “unto death,” as Saint Paul says, and that he conquered death. It is a powerful truth that should never be hidden! Take a look at these passages from St. Paul and how he uses the cross as a symbolic means of communicating the Gospel. For Christ did not send me to baptize, but to preach the gospel, not with wisdom of words, lest the cross of Christ should be made of no effect.